Looking fot a cute Gender Neutral Invitation with Giraffe for a Baby Shower with grey, yellow and mint? Look no more! 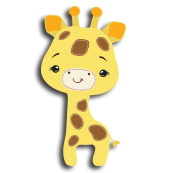 Personalized, easy to print and cut Yellow, Grey Giraffe Invitation is just right choice!